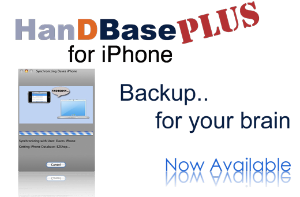 With the optional HanDBase Plus for iPhone/iPad/iPod touch add-on Mac users can sync the data on their iOS device easily to their desktops. Make changes to your database records on your Mac or your iPhone, iPad, or iPad touch and the changes will be merged when you sync. Automatically keeps multiple backups of your database files. Synchronization is automatic, but advanced settings give you control over the sync mode of each database. Share databases between various iPhones, iPod touches, and iPads, as well as other mobile devices that are running HanDBase. Note: HanDBase Plus for iPhone add-on requires an Intel Mac with OSX 10.5 or higher, and synchronization to your device requires wifi capabilities on your device and your desktop computer.